San Marino is a small country located in the central Apennines, east of Florence, Italy. The highest point, the three-peaked Mount Titano, commands a wide view of the Adriatic shore located 19 km away. Most of the republic lies in the basin of the Marecchia River, which empties into the Adriatic. It is a prosperous country whose citizens enjoy a high standard of living, exceptionally low unemployment, and extensive social welfare benefits. The capital is San Marino, a community perched on the rugged western slopes of Mount Titano. Government offices are located in the town. Ancient defensive walls encircle the city. Towers rising from Mount Titano’s three heavily fortified summits can be seen from many parts of the town. At the city’s edge, the mountain drops nearly 300 m.
Other population centers include Borgo Maggiore, a market town located 185 m below the capital on the mountain’s lower slopes, and Serravalle, a manufacturing center to the north. Tradition has it that in AD 301 a Christian stonecutter named Marinus from the island of Rab, off the coast of Dalmatia, came to the city of Rimini. Marinus soon took refuge on nearby Mount Titano, where he gathered a small group of Christians seeking escape from religious persecution. With the passage of time, Marinus was venerated as Saint Marinus, and his community developed the institutions of a small state. At first, San Marino’s economic insignificance and isolated location was a source of safety from invasion. Later, however, it became the target of Hungarian, Saracen, and Norman attacks. As a result, fortifications were built on the peaks of Mount Titano. 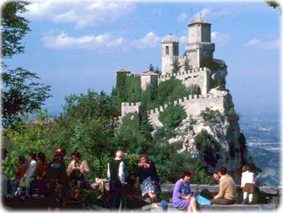 During the 11th century, San Marino became a commune and extended its sway over nearby territories. The feudal bishops of Montefeltro and Rimini opposed San Marino’s growing power, but in the 13th century San Marino’s independence was recognized by the papacy and the powerful dukes of Urbino. San Marino was seized by Italian soldier Cesare Borgia in 1503 but soon regained its freedom. In 1631, when the Papal States had surrounded the tiny republic, San Marino’s independence was reaffirmed by Pope Urban VIII. French general Napoleon Bonaparte (later Napoleon I), who invaded Italy in 1796, also respected San Marino’s independence, which was confirmed by the Congress of Vienna in 1815. San Marino has had a treaty of cooperation and friendship with Italy since 1862. The necessity for friendly relations with Italy has generally made it impractical for San Marinese policies to deviate significantly from Italian interests.